Some tabs in the WordPress Admin aren’t really ARIA tabs — they’re actually links wrapped in h2 headings and styled to look like ARIA tabs. But since they’re just navigation menus, WordPress 5.2 changes their markup accordingly. That way, assistive technologies will react to them correctly. changes the wrapping <h2> to a <nav> element. It’s worth remembering that <nav> elements also define ARIA landmarks. If your plugin or theme uses the same markup as Core, you’ll want to update it for consistency and to avoid future CSS incompatibilities. Please note: if your plugin or theme uses items that actually toggle the visibility of in-page content instead of linking to another page, then they are not navigation items. You should not use ARIA tabs nor <nav> element in that case. @westonruter also mentioned HTTPS improvements as part of the Servehappy project. *Not real but should be. What’s new in Gutenberg? READ IT! From PHP Servehappy: More testers are needed for the WSOD protection on real-life, complex sites to reveal edge cases. A “complex site” is basically any site running locally with random plugins and random code. If you’re thinking about get all up in these Focus and Component Maintainer teams, try attending a chat. Here’s the comprehensive list. Anyone can submit a ticket for the Open Floor. Send your submission to @jeffpaul or moi (@whitneyyadrich), or comment on the agenda for that week’s chat. #12563: New action on body open – Submitted via @welcher. Will be discussed in the #themereview meeting. #32326: Improve Support for Structured Data – This one pairs nicely with the ticket above, so the conversation should be happening in the #themereview room and scheduled chat. #25280: wp_localize_script unexpectedly converts numbers to strings – Submitted via @adamsilverstein and Ivan Kristianto. Lots of words about code were had in the chat, and then the conversation was moved to the ticket itself. @psykro published his proposal for a second <dev chat> and it’s open for your comments. I’m sure we’ll touch on this during tomorrow’s dev chat, too. As always, anyone is welcome to join <dev chat> every Wednesday at 20:00 UTC. As I said in the chat, to sorta quote the late, great Notorious B.I.G. 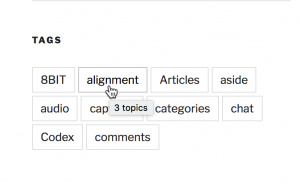 The Tag Cloud widget is still pretty popular and for a number of years, it has used title attributes to visually display the number of posts using a specific tag. WordPress 4.8 removes these title attributes and replaces them with aria-label attributes with optional counts displayed in plain text. Title attributes aren’t very accessible. Depending on the specific assistive technology and on user settings, they might be completely ignored. On touch devices, title attributes are a bit pointless. The best option is not to rely on title attributes to convey important information to users. Information that is important enough should be available to all users. In the last few releases, WordPress has been progressively removing many title attributes used in the admin screens (see: #24766). The same principle applies to the front end. The Tag Cloud widget is another step towards the progressive removal of title attributes in the front end where they’re used inappropriately. There are no visual changes by default, other than the removal of the title attributes. There is a new option for developers though: tag counts can be displayed in plain text within the list of tags. Users will now find a checkbox in the widget interface, consistent with what other widgets already do (e.g., Archives and Categories widgets). Themes can style the tag counts targeting the new CSS class tag-link-count. Also, note that wp_generate_tag_cloud() has a new show_count argument. 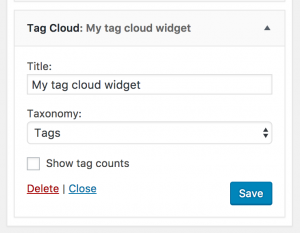 Themes and plugins that filter the Tag Cloud arguments can use this new argument to force the tag counts to be displayed. Theme authors are recommended to check how the tag counts look like in their themes and make small CSS adjustments if needed. And remember, the tag counts are not displayed by default! Users can enable and also disable them at any time. The relevant changeset is  and the related ticket is #35566. Behind the scenes, the tag cloud now attempts to determine whether to output the aria-label attribute, trying to respect the theme author’s intent. By default, the Tag Cloud displays tags in different font sizes to visually represent how many times they’re used. When tags have a different font size, they visually convey important information that should also be available to assistive technologies. Sometimes instead, theme authors set up the Tag Cloud to display all tags with the same font size. Twenty Sixteen, for example, displays all the tags with a “flat” styling. It does that by filtering the arguments passed to wp_generate_tag_cloud() and setting the smallest and largest arguments to the same value (note: this is the recommended way to output “flat” tags). Of the 17 title attributes in WordPress 4.7, four of them are legitimate because they’re used on <iframe> elements and most of the other ones are in files no longer used by core. Many of these occurrences were within loops so the number of title attributes actually output was higher, yet going from 157 down to a very few is wonderful progress. As always, any comments and contribution to improving accessibility are welcome! The HTML table layout that has been present for most admin pages should be replaced with a modern, semantically more accurate markup. As the entire table markup is created by the Settings API, we should be able to change it without major backward-compatibility concerns. We’d like to investigate moving from the current two-column layout to a one-column layout, as we agreed on that it would provide a more streamlined experience and overview. Furthermore the two-column layout makes it hard if not impossible to use fieldset (and legend) to group elements properly. For common fields used in Core and plugins, such as a simple text field, textarea, dropdown, radio or checkbox, default callbacks should be provided so that developers do not need to write every callback for such simple UI components themselves. These callbacks should be flexible and accept a standardized set of arguments that can be passed to add_settings_field(). Furthermore each callback should provide accessible markup out-of-the-box, so that even plugin settings pages can be made accessible easily. Eventually all settings pages that Core creates should be using the enhanced Settings API instead of rendering their markup manually. This ensures a more structured output and allows developers to modify the Core fields as well. All markup we create should be generalized enough to not be specific to only the Settings API pages. Several other pages in the admin, for example the user profile or term editing pages could benefit from the improvements as well once they are polished. This list may possibly be extended at some point, as there were some discussions about further developer-centric improvements, but for now we would like to focus on producing a clean and accessible markup with a better DUX being a side product of these efforts. After starting development through patches on #39441, we soon realized that this project would be better off as a separate plugin. Therefore we created a GitHub repository for the project, where all development happens now. The plugin uses prefixed functions to not interfere with Core’s own Settings API, so it can safely be tested. While working on the layout, we identified the need for thorough user tests of the changes, and we set the upcoming WordCamp Europe as our target to get a first testable version of the plugin ready. While we still need more time to get to the point where we can propose it as an actual feature plugin, we would like to get feedback sooner than later to uncover eventual pain points. We will be starting next week to discuss what needs to happen to get that prototype finished in time. If you’re interested, please attend the meeting, which will take place on Monday 16:00 UTC on Slack in the #core channel, or leave a comment on this post if you cannot make it. On January 2nd the first meeting to discuss improvements of the well-known, but not well-loved Settings API took place in #accessibility. After a healthy discussion the next meeting was set to take place last Monday. Since the suggested improvements are not solely related to accessibility, the location for the meeting was moved to #core. This post is a recap of what was decided during these two meetings. Add some basic support to automatically render fields so that plugin developers no longer need to write their own callback functions for basic fields. Get rid of the table structure to improve accessibility. Furthermore the accessibility team should also ensure that the markup generated as the core field output is accessible. The Fields API project is a huge effort that will still take a while until it can possibly be merged into core. Still, it will follow up with the changes that will be introduced in the Settings API, as @sc0ttkclark pointed out. While printing fields is certainly the focus of the Fields API, introducing a few technically simple callbacks in core at this point will not be a problem as these can be migrated to the Fields API ones at any time. While the existing Settings API has its problems, it appears to be possible to handle the necessary improvements without running into backward-compatibility issues. A completely new Settings API could have further benefits, but it would leave many users behind that would need to manually migrate, and furthermore would take much longer to scaffold and implement. After the meeting, a general ticket for the task was opened at #39441. The ticket description provides more information on how the two identified goals should be accomplished. In addition to the technical details, the first part of the accessibility measures will be to create an HTML-only prototype of what a better settings page would look like. It should be created without the limitations of the Settings API, so that the result can be the best possible example for what the enhanced Settings API should produce. @rianrietveld had four items on the agenda for the second meeting. At first, everyone was asked to review the patch that @flixos90 provided on the above ticket. The patch only applies to introducing default field callbacks, so it still lacks adjustment of the table markup and a proper accessibility review, but it shows a possible technical approach. Related to the patch, a tiny plugin was created and uploaded to the ticket as well. This plugin allows for easy testing of the functionality. For easier collaboration and possible iterations, that plugin has now been moved to GitHub. Feel free to try it out with the patch applied. Some results of an accessibility test for form elements that was conducted by the accessibility team were revealed as a preparation for the prototype settings page in HTML. A few major issues to consider were discussed, for example the requirement of IDs on every field, the proper usage of fieldset and legend elements and the problematic usage of <input type="number"> for Dragon NaturallySpeaking speech recognition software. For creating the HTML prototype, it was decided to focus on replicating the core settings pages “General” and “Discussion”. For the next step of the efforts, @afercia volunteered for creating the prototypes. As of now, the field markup he created for the two replicated settings pages can be inspected on GitHub (last two items in the list). These will probably be discussed in the next meeting. If you are interested in helping out, there are several ways for you to do so: Please review the suggested improvements, the HTML prototypes and/or the technical approach. Feedback can be provided on the ticket, this post or by participating in the upcoming meeting/s. The Settings API meeting takes place biweekly on Monday at 17:00 UTC, so feel free to drop by. The next meeting will be on Monday, January 30. WordPress 4.7 includes a change to the way image alt attribute values are generated. Formerly, any time WordPress created the markup for an image with an empty alt value, it would attempt to use either the caption text or the image title—in that order—as a fallback value. In 4.7, we have removed this fallback behavior. To ensure your images having meaningful alternative text, you should make sure to set a value for alt text in your media library. The intent of the fallbacks were to ensure each image included alternative text. In practice however, this fallback behavior often resulted in poor user experiences for people using screen readers. As counterintuitive as that may seem, let’s take a look at some common examples. Consider a situation where we’ve uploaded an image named “edbc4ef7.jpg” without changing any additional information. 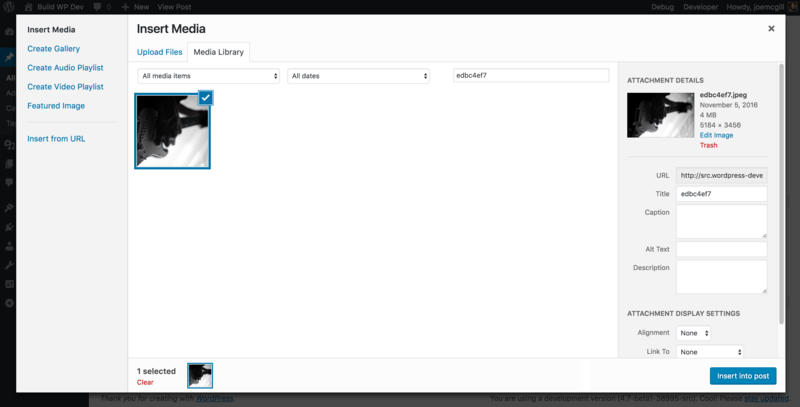 WordPress will generate the image title from the file name as shown in the following screenshot of the insert media modal. Attachment details for an image shown in the insert media modal. A person using a screenreader on this page would end up hearing the file name read to them, which is not the most helpful experience, and can be quite frustrating when the file name is lengthy. The same article goes on to explain that an alt attribute value may be omitted when an identical figcaption is present, to avoid redundancy; but best practice when using a figcaption is to provide a separate and different alt attribute to describe that image to users of screen readers. In each case, omitting the alt attribute entirely may result in screen readers reading the file name from the src attribute, so WordPress includes an alt attribute with an empty value, i.e. alt="", whenever the alternative text hasn’t been explicitly set—a technique that is common when an image is decorative. This change will not affect content already published, but will be the expected behavior for any new content published after upgrading to 4.7. For more background on this issue, see ticket #34635. 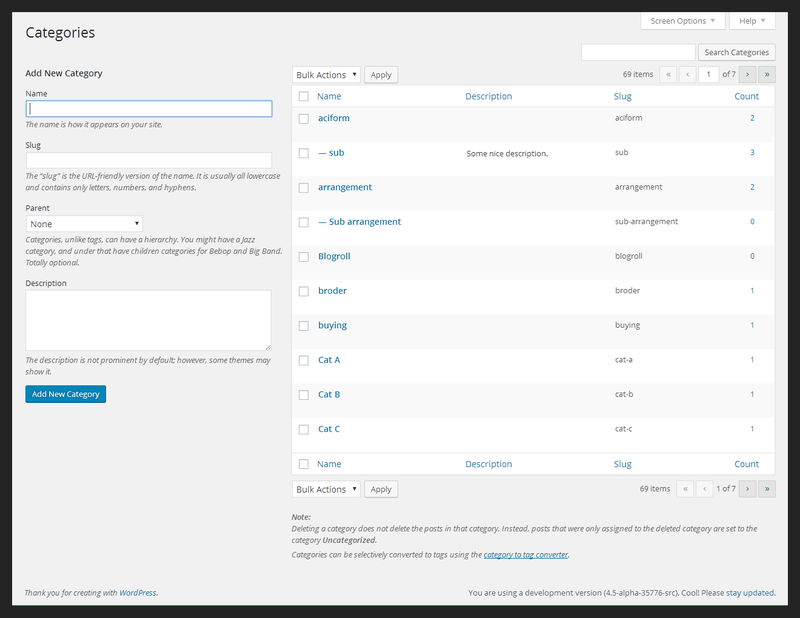 In WordPress 4.6 the Categories and Tags screens (and all the custom terms screens that use the same edit-tags.php page) will change in order to make the visual order of the main elements match the tab order. This change is focused on helping people who use the keyboard to navigate the content or use assistive technologies such as screen readers. If you’re a plugin or theme author and you’re providing custom functionalities in these screens, there are a few things you should check. For accessibility, the visual order should always match the tab order. The main functionality in a page should just be the first thing in the source markup and other parts of the user interface should never be “skipped”. 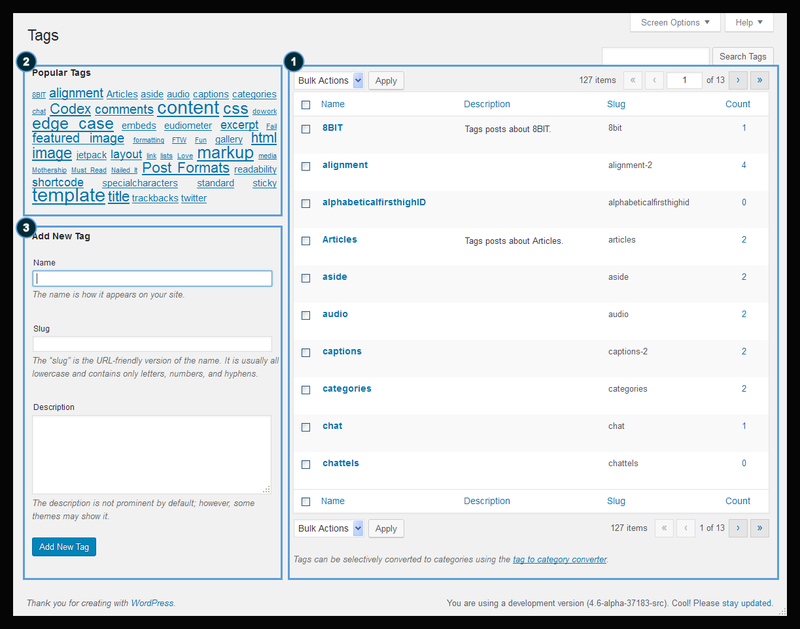 The screenshot below illustrates the current Tags screen. The main content is split in two columns. The first element in the source is the right column with the table to list the terms followed by the tag cloud for the popular tags and the form to add new tags. 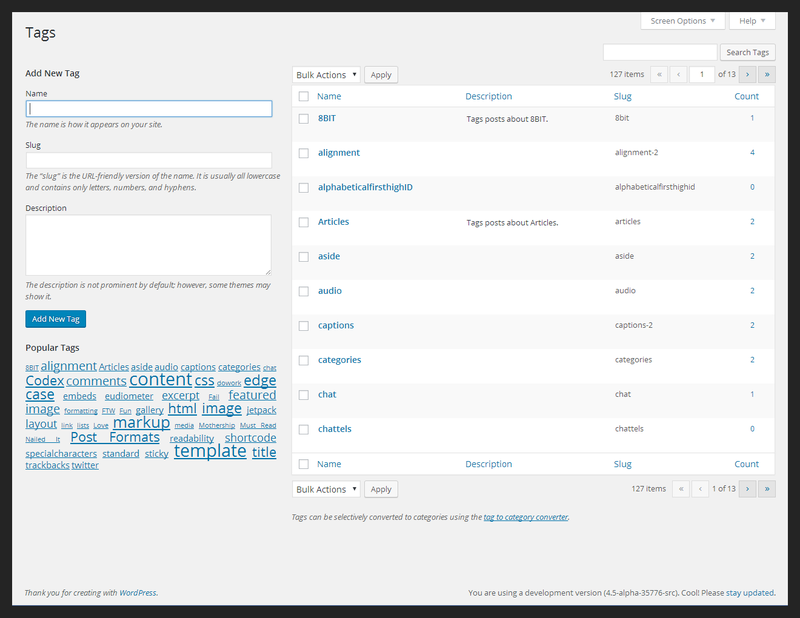 The current order of the main content elements in the Tags screen. On page load, the initial focus is set on the first focusable field in the form which is the third and last block of content in the page. When using the keyboard or a screen reader, content navigation is a linearised process. Starting from the form to add new terms makes sense since this is the main task on these screens. But then users will move forward and they will find just the footer of the page. When relevant parts of content are skipped, it’s more likely for screen reader users to be confused or experience difficulty navigating pages. They just don’t have a clue there is something “before” their navigation starting point. Keyboard users will have to tab backwards to get to the previous content. The two columns in these screens will be swapped. The first one in the source will be the left column, followed by the right column. Also, in the Tags screen, the tag cloud will be moved after the form. Visually, this change will make these two screens more consistent. From an accessibility point of view, the content structure and organization will be easier to understand and navigate. Note: For more in-depth information see the related Trac ticket: Edit term screens: tab order should match visual order. Get ahead of 4.6 and update now! If you’re a theme or plugin developer: now is a great time to check your code! Help us to make the Web a place designed to work for all people. Any feedback and thoughts are more than welcome, please let us know in the comments below.